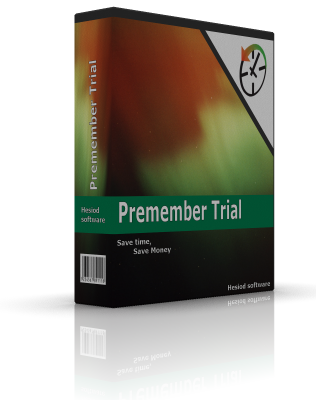 The trial version allows you for a test drive of 31 days of all functions of Premember. After this period you will be offered a choice, to use the Standard or the Light version of Premember. *1 Premember itself takes about 10 MB for the actual program the metadata and screenshots account for 200 to 300 mb a day.These can easily be deleted by one click of a button in the configuration dialog or configured that there is only a maximum number of days of screenshots saved. *2 Premember is build on the Microsoft .NET technology and therefore requires .NET Framework to operate on. If you don’t have it pre-installed on your computer, you can download it from the Microsoft website : Microsoft .NET Framework Version 2.0. *3 This is needed for exporting to word and importing from outlook, Premember can be used on a system without office but these 2 features will then be not available. By downloading you agree to our End User License Agreement (EULA), Please click here to read it. During the trial period or after the trial period is finished Premember can be upgraded to the Standard Version. This is doing by going in the Main Menu to “Help” -> “Activate Standard Version” and clicking the “Purchase Serial” button. After you have purchased the Standard version you will receive a serial and name which you have to insert in the activate window. When you now press “Ok” you will have unlocked the Standard version.